There are several forms of HIIT workouts, and they all have one uniting philosophy: Do each fat burning workout exercise at a high intensity, with short rest times in between, for maximum results. The good thing about this HIIT workout below is there’s no equipment required, so you can really focus on the intensity of each exercise. No gym? No problem! Just find a little open space, set up your timer, and get to work. You may just find it’s one of the best workout sessions you ever had. A HIIT session should consist of 30-second active intervals and intermittent rest intervals of 10 seconds. The aim of each exercise is simple: Just do as many repetitions of each as possible within the 30-second active interval. Aim for 10, 30-second rounds. Here are six essential bodyweight exercises to incorporate into your HIIT workout routine. To do a proper burpee, start crouched on the floor, go into a classic pushup pose, and do a pushup. Then from as low as possible, explode upwards with a jump while landing and going straight back to the starting pose. High knees are another explosive full-body workout that really targets the abdominals and also does a great job all over as a no-equipment cardio workout. Stand with your feet about shoulder width apart and start to lift your right knee toward your chest while quickly interchanging with your other knee as soon as the foot touches the floor. Focus on pumping your arms and keeping your spine straight. If you haven’t had the chance to actually climb a mountain, maybe you should try mountain climbers to get a taste of it. Start in a classic pushup position and bend your knee, bringing it up to around the hip area. Explosively bring the other knee alternately to the same position. Continue interchanging both knees rapidly for 30 seconds. Mountain climbers will strengthen and sculpt the quadriceps muscles. The perfect recipe for getting rock-hard abs is the V sit-up. To do this exercise the correct way and get maximum results in minimal time, lie flat on your back with your arms stretched out above your head and legs stretched out. At the same time, reach both your legs and your arms to meet and touch in the center. 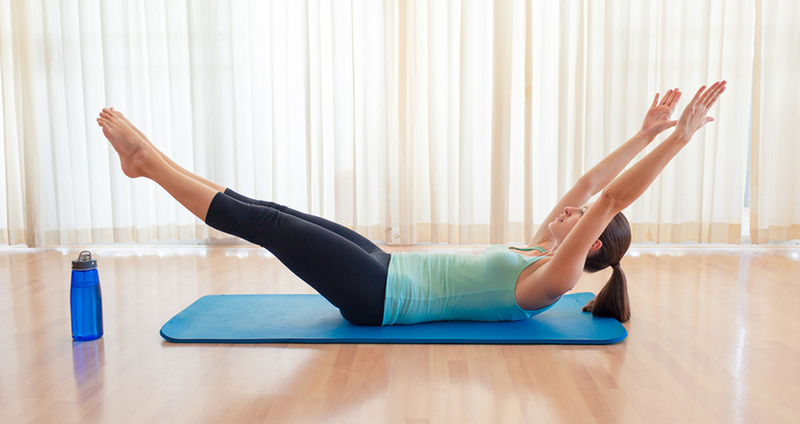 Do this while raising your back and torso in a jackknife-like motion. Dive bombers a fusion between a yoga pose and a push-up, but don’t be fooled; these exercises will strengthen and carve the chest, shoulders and triceps. The exercise starts in an upward dog position with the body supported on both arms and the elbows flared outwards. Slowly push downward, bringing the chest as low to the ground as possible and then coming back up in a downward dog pose. Repeat the exercise for as many reps as required. Another exercise that’s well known, and an effective component of any HIIT workout routine is the crunch. Lie on your back with your hands clasped behind your head and your knees folded. Slowly raise your head as far as possible while contracting your core.